A federal judge denied Boston University and a College of Fine Arts professor’s request to dismiss five of 10 claims related to a sexual harassment case that CFA students brought against them, according to the judge’s order filed on Monday. CFA student Erin Shyr and former CFA student Maria Currie filed a lawsuit in Suffolk Superior Court against Boston University and CFA professor Eric Ruske in April. The lawsuit claimed Ruske sexually harassed the two students and that BU was negligent in handling the case. In September, the university and Ruske sought to drop five of the 10 allegations listed against them, including one Negligent Hiring, Retention, and Supervision claim from Currie, two Intentional Infliction of Emotional Distress claims — one from each plaintiff — and one Assault and Battery claim from Shyr. The court denied all motion to dismiss. “Despite his position of authority, Ruske engaged in unseemingly conduct that he directed toward the two young women,” United States District Judge Denise Casper wrote in the court order. BU spokesperson Colin Riley wrote in an email that the ruling only impacts the defendants’ motion, that “the plaintiff’s claims meet the minimum legal standards necessary for the case to proceed.” It’s not a ruling on the merits of the two students’ claims, he added. 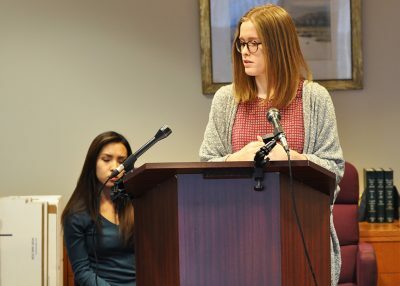 During a press conference on Wednesday, Shyr and Currie’s lawyer Sara Burns criticised BU’s and Ruske’s response to the allegations. Riley confirmed Ruske remains a professor in CFA for the 2017 spring semester. Ruske did not immediately respond to requests for comment. One of the claims the defendants sought to dismiss was that Ruske inflicted intentional harm on Currie and Shyr, Burns said. “Attorneys from BU and Eric Ruske went so far as to argue that Ruske simply intended to show affection to these young women, to express a desire to engage into a romantic relationship, not to harm them,” Burns said during the conference. Shyr, now a senior in CFA, said she found the court’s decision relieving. “Knowing the court’s decision that all 10 counts will go forward is reassuring because it means that someone is taking [Currie] and I seriously,” Shyr said during the conference. Currie and Shyr both acknowledged the social and academic hurdles they have faced since filing the lawsuit, including estrangement from fellow music students and professional musicians. Shyr said this negativity fed into her decision to change career paths. Beyond just detractors, as Shyr is still enrolled in CFA, she said she ran into Ruske several times after filing the lawsuit. When she encounters Ruske, he no longer acknowledges her presence, Shyr said. Burns said the impact of the court’s decision stretches beyond legal justice. Haley Fritz and Till Kaeslin contributed to the reporting of this article.